Cheesy and satisfying, this is a delicious anytime snack. 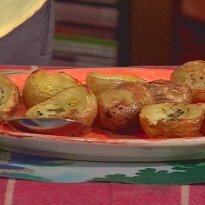 1.Cut the potatoes into two halves. 2.Scoop out the insides with a spoon. 3.Oil the skins all over with your fingers. 4.Put them in the oven at 200 degree C for 10-15 minutes or till brown. 5.Remove from oven, spread a little mustard on the inside and fill them with cheese. 6.Sprinkle a little oregano on top and put them back in the oven for five minutes till the cheese melts.